How do you create a Daily Routine? You know you need one; everybody tells you that you need a Daily Routine for getting your work done. It’s especially important if you have to squeeze in time to do your business after you’ve taken care of the time away from home on your job. 1. Start with the end in mind. Ask yourself, what is the quality of life you want to have 12 months from now? Then break it down. How many customers and/or business partners/team members will you need to have in order to accomplish the amount of income you would need? How many presentations will you need to give in order to obtain them? 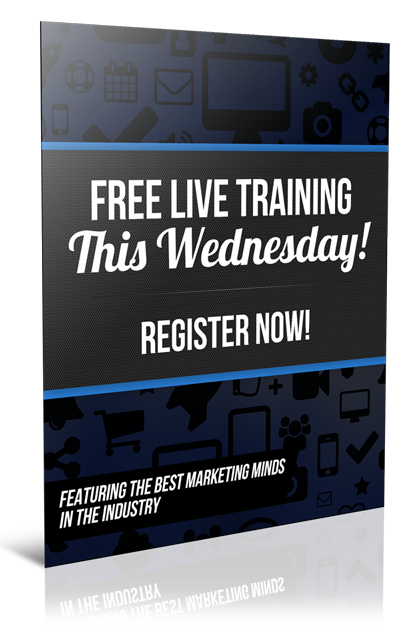 Are you going to give those presentations in person or do you have an automated system? 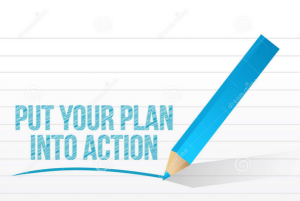 Once you have that figured out, develop a plan and work backward. How many per month, per week, per day will you need to do? That number that you need to do daily needs to be part of your daily routine. 70% of your time should be spent actively prospecting and talking to people or other income-producing activities. This is the highest and best use of your time. 20% of your time should be spent learning your marketing strategy and mastering it. You don’t want to try to learn more than one strategy at a time or you will get confused. I remember when I got a job with an online book dealer, they taught me only one of the many sales formats at a time until I got good at it. For instance, they sold books on Amazon, Alibris, Abe, Half.com, eBay, and several more that I don’t remember right now. The point is, they didn’t show me the next platform and the routine for getting and filling the orders on each until I was proficient in the one I was working on, and then add them as I learned each one. Then in no time, I was able to fill all the orders on each site with no problem. But if they had tried to teach me all of them at once, I would have just ended up confused and probably would not have stayed at the job very long. If you want to learn some marketing strategies, I suggest you get an MLSP membership. They have a whole training library as well as specific training on different strategies. But again; choose one and stick with it until you are proficient in it and getting good results, at least 90 days. If you’d like to take a trial run of an MLSP membership where you can access all these trainings, GO HERE. However, you will want to limit the time to 20% of your total for learning. You also need to implement what you learn and teach it to others. It’s a great way to have plenty of content to share. Simply choose a training, study it, do what it says, and then create a piece of content to share what you learned and your results from implementing it. The final 10% of your time should be spent on personal development. Whether it’s a daily mindset recording you listen to, something you read, this could also include time to pray and meditate. So many people want to skip the personal development, but you will need it in order to be able to fight through the mental garbage that comes your way–from your own thinking or from others who will try to talk you out of your dream. 3. 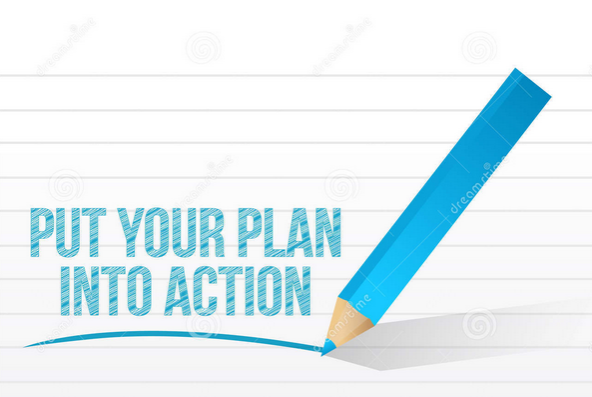 You need to commit your daily activities to a schedule. Here’s where the rubber meets the road. I like an old-school paper planner and then use it together with the CRM (Client Relations Manager) I get with my MLSP membership. This is a great help with your relationship building so you don’t forget what you talked to the person about last time. For example, I just talked to a person who had some health issues and wanted me to get back to them in a few weeks. I was able to enter that info in the CRM and set the task for when to get back with them. Now I don’t have to worry about forgetting; I will get a reminder along with all the info I need to pick up where we left off. If you want to check out the CRM, you can do that HERE. They actually give it to you for free with an MLSP membership! 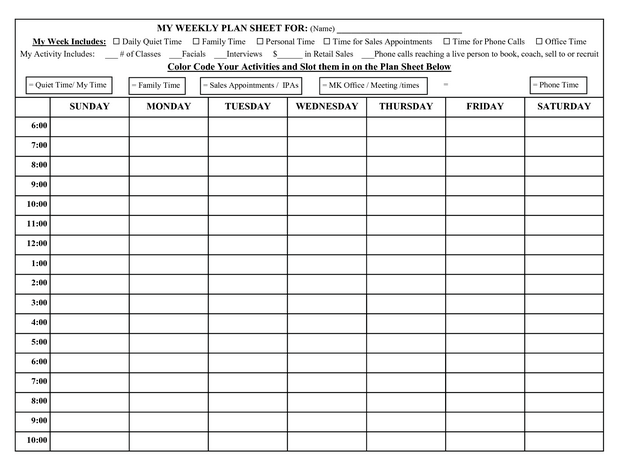 A paper planner is also good for planning out your blog content and marketing schedule over the next 30 days. I like to lay out a month at a time, and I use a paper calendar for that. Seems to help me to visualize it better. However, if you prefer to use one of the many online tools and/or apps for this, you certainly can. This is huge: You need to identify your daily working hours as part of your plan. 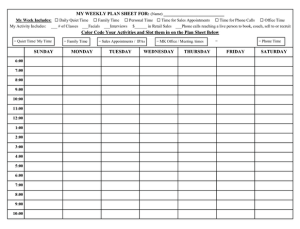 Again, I like to use a paper weekly schedule so I can see it and touch it. 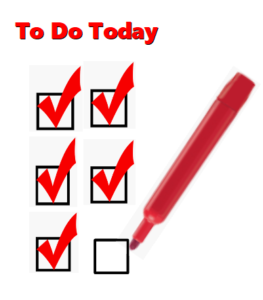 First, take a dark color or red marker and block out all the time you won’t be available for working your business. Do you have a job? What other commitments do you have, like family or social events you need to attend? Block all those times out. Then block the times you WILL be available to work. (I like to use green for these, and I draw a box around the square so I can write in it). Watch out for pitfalls like having a Superman or Superwoman complex. You can’t go from zero to hero overnight. Just keep in mind it will take some time. The main thing is to be consistent. 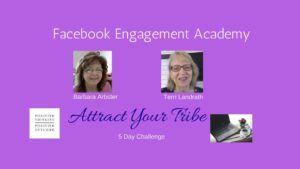 In your daily routine under the 70% of your time, you will want to connect with 5 to 10 people every day–not pitching them, but just meeting them and establishing a relationship with your network. You will want to create one piece of content every day as well. This will be your library that you can refer people back to over time. Schedule in your family and friends fun time too. You want to be a well-rounded person and not a maniac and you want to stay connected to the people who matter to you…and perhaps are doing this for. When you commit it all to paper, somehow it just seems more real. P.S. 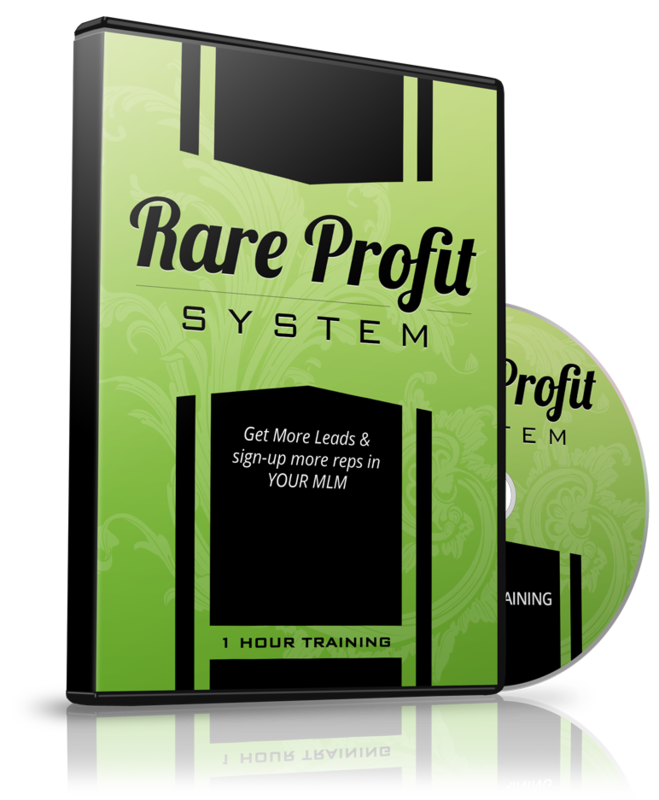 Success leaves clues and our most successful friends all follow the Top Earner 5-Step Profit Blueprint. 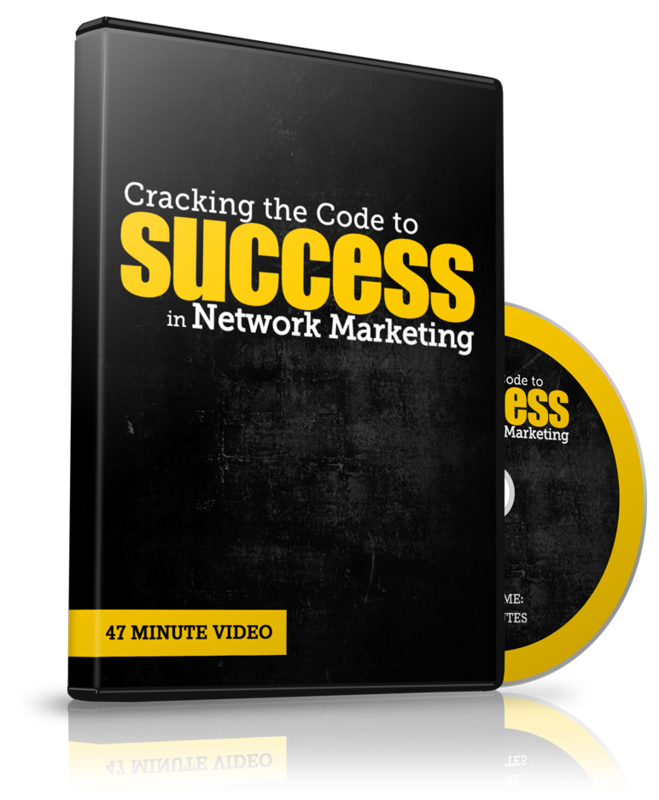 Click here and you’ll be taken to a FREE video which reveals the EXACT blueprint you can swipe to generate leads to build your business…unless you have too many leads already! I’m a huge Stephen Covey fan, so I am always “preaching” start with the end in mind. Great reminder of why managing your work rather than letting your work manage you is so important. Thanks Kelly, yes Covey’s teachings are great. I loved this article! Lots of usable info there. Thanks!